The Swiss musicians from the merger between Artist Consort and Genuin have by now given us so many wonderful CDs. 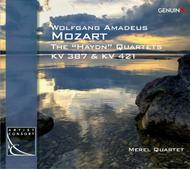 And the latest one, too, with the young Merel Quartet from Zurich, augurs pure listening joy. The four string players, unswervingly pursuing their artistic path with a wide repertoire, also away from the mainstream, and regularly appearing as guests at all the major festivals, present to their listeners two mature Mozart quartets that appear as an opposing pair of siblings: brightness and darkness, vitality and pain, extroversion and inwardness. All this in wonderfully explored, exciting and sonorously beautiful interpretations.